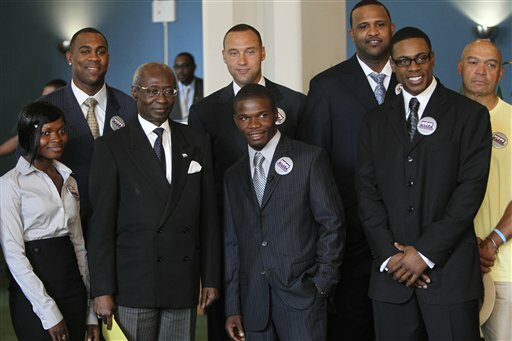 Hope Week recipient Mohamed Kamara (center), from Sierra Leone, with players on the Yankees (2010). The Yankees are holding their 18th annual Holiday Food Drive today, from 10 a.m. – 3 p.m. The Food Drive is presented by White Rose Foods, but they will combine with Domino, General Mills, Unilever, ConAgra, Smucker’s, Barilla, Nestle, Red Gold, Georgia Pacific, Pinnacle, Motts and Kraft to donate over 60,000 pounds of food to those who need it. Also, of interest, is that Joe Girardi will be arriving at about 10 a.m., and star second baseman, Robinson Cano, will be arriving at about 11 a.m and will stay until noon. They will assist in collecting food items and also greet fans. Any fan that brings 30 or more pounds of non-perishable food will get a voucher for two Grandstand or Bleachers tickets for one of any 22 selected games during the 2012 campaign. That is definitely incentive to bring food for those that need it. Since 1995, the Yankees have made the playoffs every year except 2008, and have won five rings, but it can’t be forgotten that time and time again they find a way to give back to those less fortunate in NYC and the surrounding area. Numerous stories have posthumously come to the forefront about how former owner, George Steinbrenner, helped people he came across without wanting any limelight for it. Jack Curry wrote a story many months ago about how Steinbrenner saw a kid near what was formerly Legend’s Field, and now is Steinbrenner Field, causing minor havoc with some friends and proceeded to take him inside for a conversation. As far as I remember, after talking to him he realized he was a high school kid who just needed some structure outside of school so he offered him a part-time job with the Yankees. This would set him on the right path. Steinbrenner had the reputation of being tough to deal with partly because of how he treated his expensive acquisitions, everybody from Reggie Jackson to calling Hideki Irabu a Fat Toad, but he liked helping people in the community as well as Darryl Strawberry, who he helped get back on track by signing him in 1995 and not giving up on him after he sometimes reverted to his alcohol/drug addictions. Strawberry was an integral part of a few championship teams, but now that he is recovered he admits that he does owe a lot to Steinbrenner. The Yankees organization also deserve a lot of praise for Hope Week, which will be in its fourth year in 2012. Hope Week stands for Helping Others Preserve and Excel. Last season, along with the two previous ones, they truly brightened the lives of people from six different organizations who needed something positive in their life. It definitely seems like the coaches as well as the players get as much out of this week as the people did from the groups that they were helping. The players all seem to look forward to interacting with the kids, at the stadium, and in places around the five boroughs. On the same note, when they showed the kids as well as their mentors from their respective organizations, they were truly ecstatic to have a break from their day-to-day lives with the luxury of spending hours with the Yankees. Even though the new Yankees Stadium turned out to be an impressive palace of sorts, originally building the new stadium seemed like somewhat of a mistake because their was not a specific timetable for replacing the playing fields that they were getting rid of. Many PSAL (Public School Athletic League) high school football, baseball and soccer teams used those fields for practices and games. However, true to their word, they delivered on even better fields than before, for high school teams as well as others to use. The Yankees have more money at their disposal than any other baseball team partly because they are in the biggest media market in the United States and own the YES network, which is the most watched regional sports network in the country. They get criticized by “haters” because they “buy championships”, but they have only won one since 2000. The money has helped sign some of the better players in baseball, but they have also had some acquisitions that have backfired – Carl Pavano, Kei Igawa, A.J. Burnett and Jeret Wright. The money that they have based on the revenue stream from the YES Network, sky-high ticket prices/concessions at Yankee Stadium as well as all other venues has, as pointed out above, helped the team greatly benefit people in need in the New York area as well as in Tampa, where they have Spring Training and a minor league team. It is inspiring that the Yankees have had this Food Drive for 18 consecutive years and Hope Week is probably the most overall impact that a single sports team makes during a given week.